Every year about this time, violin teacher Fran Taylor starts recruiting new violin, viola and cello players from the ranks of Burlington School District’s fourth and fifth graders. She sends parents a letter informing them that every child can take a weekly, hour long group lesson on one of those instruments after school, regardless of the family’s ability to pay. When needed, the letter explains, instruments are provided free. 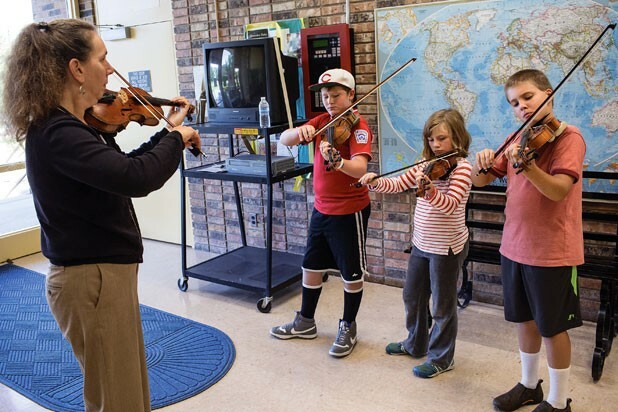 Taylor runs the BSD’s after-school strings program, which has provided strings instruction at each of the district’s six elementary schools for the past 21 years. The shoestring operation receives little recognition — Taylor doesn’t even have a BSD email address. But year after year it has provided families with access to an area of the arts that usually requires significant financial outlay. “With sports, it’s relatively easy to try something out, but with music, it’s typically private lessons” — plus the cost of renting or buying an instrument — notes Alice Stokes, mother of after-school-strings graduate Ada Case. Case started playing violin in the program as a Champlain Elementary School fourth grader and continues to play as a seventh grader at Edmunds Middle School. The after-school program, Stokes says, was “a really accessible way” for her daughter to try out something she wasn’t yet sure of liking. Case qualified to be loaned a violin while in the program because she receives free or reduced lunch. Taylor estimates that about half of the program’s 90-odd yearly participants receive loaned instruments from a collection owned by the district. (Parents of the rest rent from Ellis Music in Bethel or the Burlington Violin Shop.) Children who are given loaners sign an agreement to take care of the instrument, but otherwise it’s theirs to take home and practice on for the year. The BSD after-school strings program fills a significant gap. Aside from the newly launched ONE (Old North End) Strings in-school program for all fourth and fifth graders at the Integrated Arts Academy at H.O. Wheeler, it is the only way for elementary students to gain access to strings playing. Otherwise, students would have to wait until sixth grade. The district’s two middle schools and high school offer orchestras and in-school lessons. Strings instruction in public school used to be as standard as band and choir, and it still is in some states. According to Taylor, the Burlington school district had a full orchestra program until budget cuts led to its being dropped around 1990. Burlington Friends of Music — the precursor to the Vermont Youth Orchestra Association — launched the after-school program in 1992 to fill the void, and Taylor began teaching in it the following year. Aside from running the program, Taylor is the after-school teacher at Champlain Elementary. The others are Patricia Fitzgerald at C.P. Smith and Flynn, Leeeza Robbins at IAA, Holly Thistle at the Sustainability Academy at Lawrence Barnes, and Rachel Keyser at Edmunds. Among Chittenden County school districts, only Essex has maintained a strings program for its elementary-through-high-school students over the past couple of decades. None of the four K-8 feeder schools for Central Valley Union High School — Shelburne, Charlotte, Hinesburg and Williston — has a strings program. Faced with budget cuts, CVU ended its orchestra program last year, according to the school’s former orchestra teacher, Kathleen Kono. Private schools generally fare better, of course. All third graders at the Waldorf School in Shelburne are started on a string instrument. But annual tuition there is $11,000. Plus, Keyser adds, teaching young string players has its own rewards: “It’s so great to see the expression on a kid’s face when they get a note right,” she says. Hakim is also the orchestra teacher at both middle schools and says “the majority” of his after-school students — there were 10 cellists last year — join the orchestra in sixth grade. Many go on to play for years. Emma Goldberg, now 28, first tried her violin chops as a C.P. Smith fourth grader in the program. She recalls, “They came into our school with instruments and it sounded super-cool, and I went home and said, ‘Mom, I want to play violin.’” Now Goldberg is a violin teacher with a private studio in Brooklyn. After college, Goldberg returned to teach in the program at Edmunds, Wheeler and Barnes. After only two years of living in New York City, she launched a similar strings program for pre-kindergarten-through-second-graders at the local P.S. 316 in Brooklyn. “A lot of these kids would, like, never get a chance to play a string instrument,” Goldberg comments. The observation would sound familiar to Taylor and her crew of strings teachers who have kept the BSD after-school program going strong. The after-school strings program is open to children in the Burlington School District starting in fourth grade. There is no designated website; for more info, contact your child’s school.